Bushy evergreen with upright shoots. 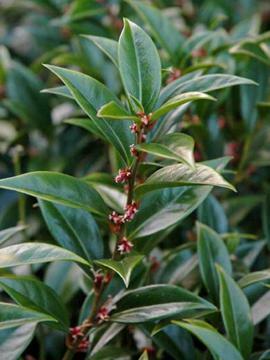 Comparatively large, broad, mid to dark green leaves, up to about 8cm long. 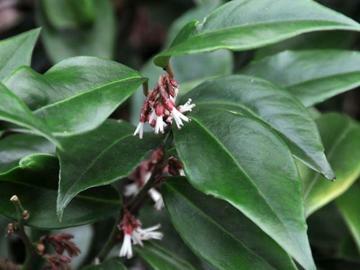 Sweetly fragrant, small pink-tinged, white flowers in late winter. Shiny black berries follow later. Slow growing but may sucker to form low thickets. Tolerant of various conditions but best in moderately fertile, humus-rich, moist, well drained soil in full or part shade. Fairly drought tolerant once established. By seed, semi-ripe cuttings in late summer, or by removal of rooted suckers. Introduced from E China by Roy Lancaster in 1980. Less commonly cultivated than other species.